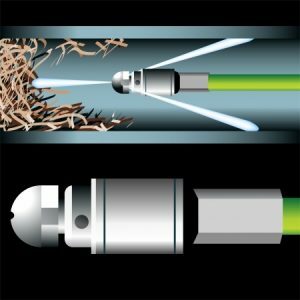 Using a hydro jet is an efficient way to clean pipelines of stubborn debris build up. If snaking the pipeline or using chemicals to break down a clog is not doing the job, a hydro jet is a fast and reliable way of clearing lines with little to no mess in the process. We provide hydro-jet service in West Los Angeles and surrounding cities including Beverly Hills and Pacific Palisades. Contact us today for more information. A hydro jet system is similar to a pressure washer, but has a much higher water pressure and is usually only used for commercial servicing like sewer line cleaning. They are best used for cleaning clogs out of drains and pipelines. A hydro jet is considered more reliable in clearing blocked pipes without having to worry about another forming in the near future. A hydro jet system should only be used by a trained professional plumber in order to guarantee the pipelines are cleaned properly and further damage is not done because of misuse of the jet. Hydro jetting is an alternative to using a drain snake or chemicals to deal with a blocked pipe. Sometimes chemical removal just doesn’t work or will leave behind residue that can create a new plug. Using a hydro jet will clean the pipeline thoroughly, leaving no trace of residue behind. Our team of plumbers is specially trained in using hydro jetting to clean out sewer lines efficiently and remove the toughest debris such as tree roots that have grown through the pipe. If you need pipelines cleaned and repaired in West LA or Bel Air, CA give Sunset West Plumbing a call at (310) 454-2010. We offer hydro-jetting and sewer cleaning services that fit your budget. Contact us today to schedule an appointment. We will send out one of our professional plumbers to determine the source of the issue and get it cleared out right away. Updated on June 15, 2016 at 3:53 pm by Sunset West Plumbing & Rooter.